Bomb-powered spaceships, mininukes, atomic excavation, and other bizarre uses for our nuclear arsenal. Also see: A map of the nuclear bombs in your backyard and a look at our expensive, expanding nuclear weapons complex. US government scientists have been dreaming up unusual applications for nuclear weapons since the earliest days of the atomic age. Here are a few schemes that developed new uses for the world’s most destructive technology. 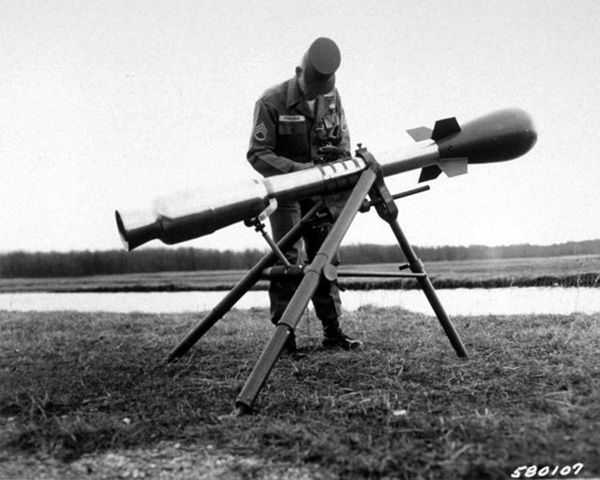 Atomic Annie: This nuclear field cannon could fire a nuclear shell up to 20 miles. 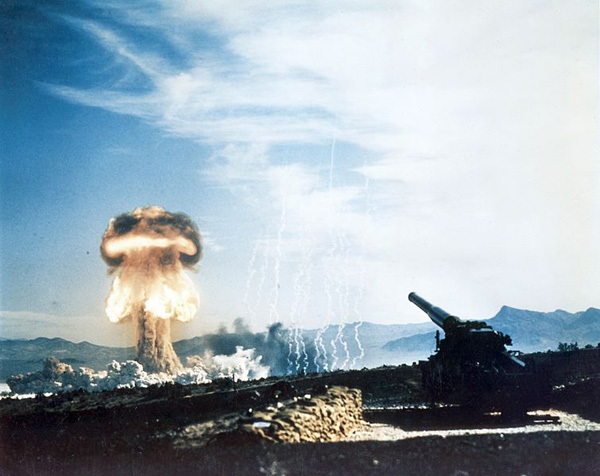 It was fired only once, at a May 1953 test in Nevada captured in the video below (the gun goes off at 0:33). Fun fact: The 280-mm artillery piece (presumably unloaded) was part of President Dwight D. Eisenhower’s 1953 inaugural parade. 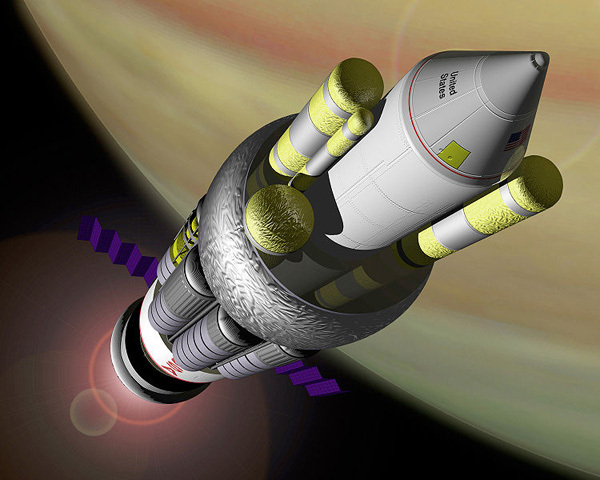 Project Orion: This sci-fi plan would have propelled a rocket ship by dropping 800 atomic bombs in rapid succession beneath it. NASA entertained it as an option for powering a manned mission to Mars until the Nuclear Test Ban treaty put the kibosh on it. 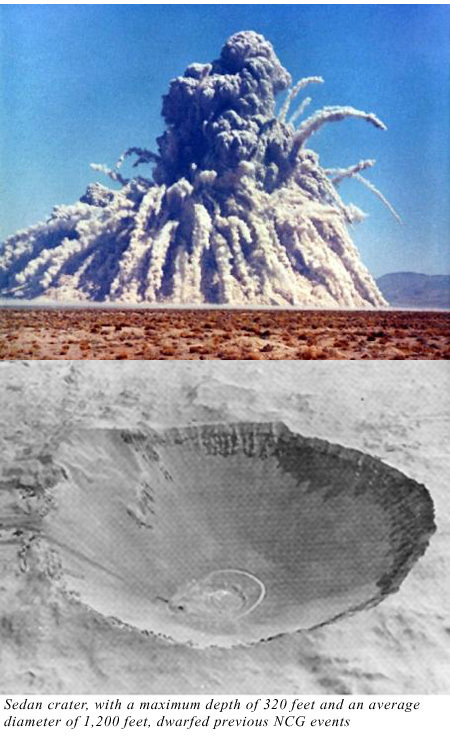 Operation Plowshare: Underground nuclear tests often left behind huge craters, so someone got the bright idea to use nukes as giant earthmovers. As part of the Plowshare project, 27 bombs were set off between 1961 and 1973, and plans were drawn up to use nuclear explosions to create new roadways, widen the Panama Canal, and tap natural gas reserves. The 1962 Sedan test, shown below, left an enormous crater that was used to train moon-bound astronauts and is now a tourist attraction. Atomic land mines: Long before fears of suitcase nukes, the US designed and built small bombs to hide behind enemy lines. 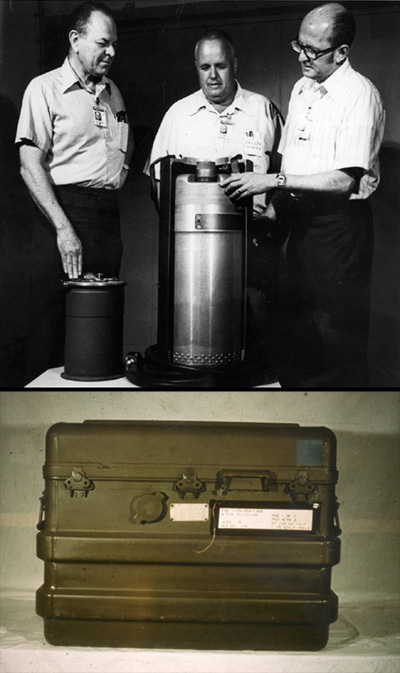 Weighing 400 pounds, the Medium Atomic Demolition Munition wasn’t easily portable—but a smaller model, the W54 Special Atomic Demolition Munition, weighed 163 pounds and fit into a handy carrying case. Airborne ICBM launcher: When design engineer Scott Lowther worked for defense aerospace firm ATK, he came across designs for a “flying ICBM launcher” made from a retrofitted jet liner. 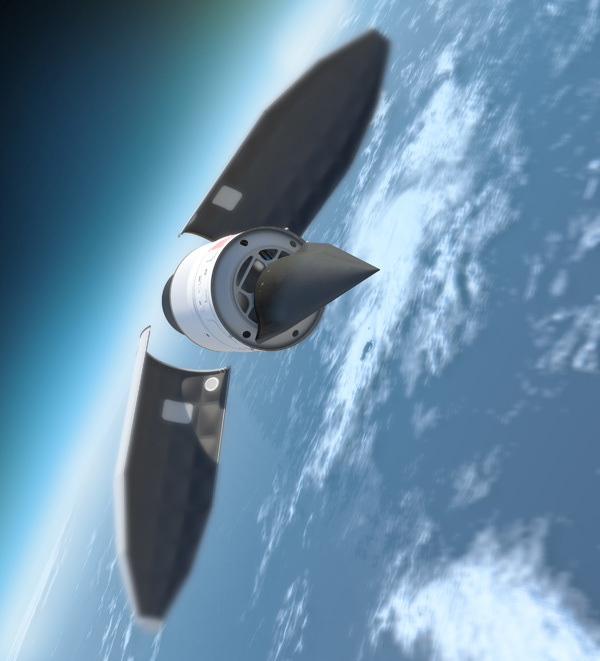 “It’s a neat idea, but it seems to be tackling the concept of launching big rockets from jetliners the *hard* way,” Lowther, now aerospace historian, writes in an email. 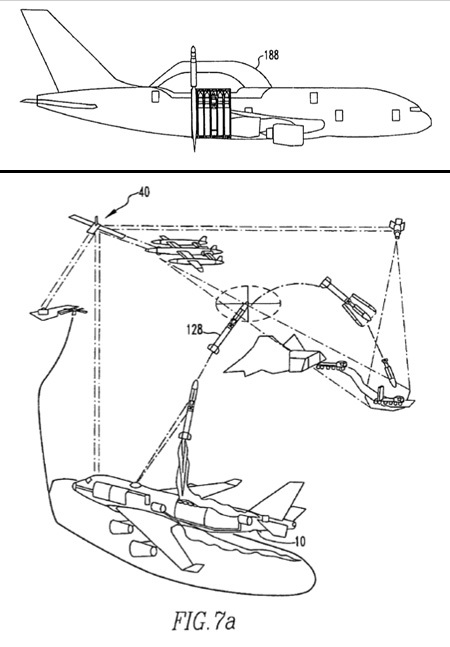 But, he adds, “It’d be a hell of a thing to see, though.” Below, drawings from a patent application for the plane. Prompt Global Strike: This project, conceived in the Pentagon under Defense Secretary Donald Rumsfeld, envisions using ICBMs to deliver nonnuclear explosives anywhere in the world at a moment’s notice. Even though this weapon wouldn’t involve nuclear warheads, one possible flaw is that its profile would be hard to distinguish from a conventional nuke—which could be a problem if it had to fly over, say, Russia or China. Asteroid interceptor: What do we do if a planet-killing asteroid is heading our way and we can’t send a motley crew of demolition experts into space to blow it up? 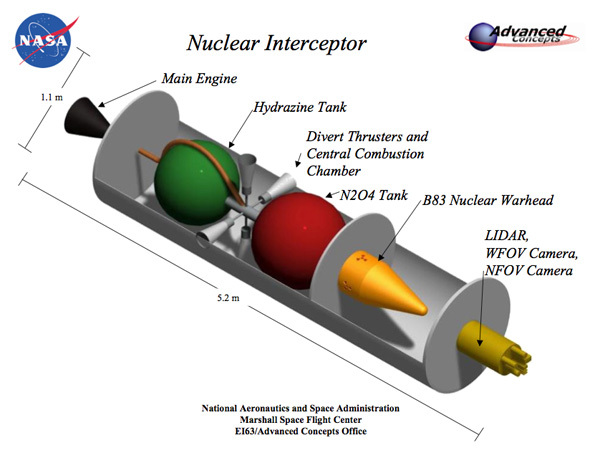 Scientists at NASA and Lawrence Livermore National Laboratory think a spare nuclear warhead could “nudge” it out of our path.